At the bottom floor of the building with a dog signboard, in the shopping district near the office street, there lies a cafeteria called "Youshoku no Nekoya," that has an illustration of a cat on the door. It's been open for fifty years and has satisfied various salarymen from nearby offices. Despite it being called a Western cuisine cafeteria, it also provides other varieties of menus. For the people of this certain world, it's their one-and-only special cafeteria. There is, however, one secret to "Nekoya." The cafeteria is closed to the public every Saturday in order to make way for special guests. When a bell rings, customers from different places of birth and races appear who ask for mysterious and delicious dishes. They are actually the same dishes served to the salarymen, but these special guests find them to be more exotic than to what they are used to. 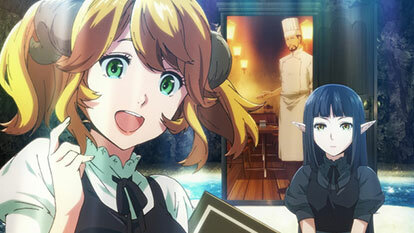 As the cafeteria aims to serve masterpieces, it is usually referred as "Isekai Shokudou." And so, the bell rings again this week.